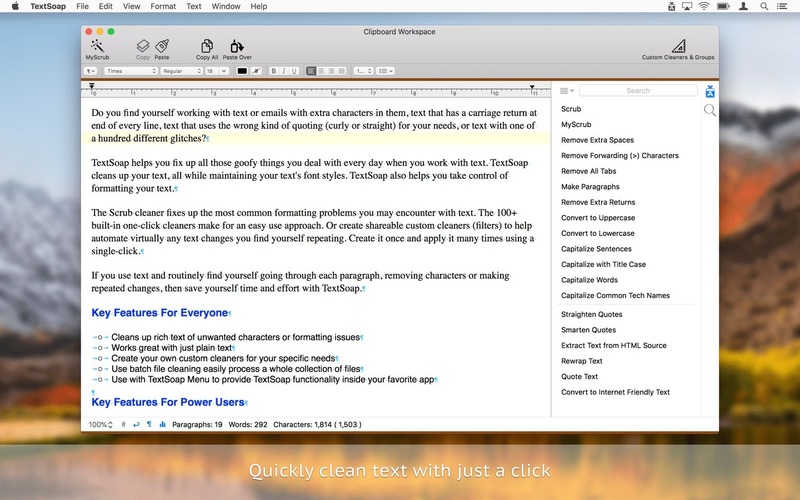 TextSoap 8.4.10 – Automate tedious text document cleaning. TextSoap is for people who work with text. TextSoap effortlessly cleans up text from endlessly different formats. Wash away unwanted characters, spaces, tabs. Fix paragraphs with hard returns at the end of each line, as well as a myriad of other formatting issues that come your way and do it all while retaining desired font styles. Unlike finding and replacing each of dozens of typical formatting issues or manually perusing through a file to find errors and fixing them by hand, TextSoap can automate that task down to just one click. And you can do it all from within your favorite app using the TextSoap Universal menu. Easy to learn for casual users, TextSoap also has the flexibility that serious users need. Next story Path Finder 8.3.8 – Powerful, award-winning Finder alternative. Previous story GoLand 2018.3.3 – Capable and Ergonomic Go IDE. Marked 1.3.3 – Open multiple file types as rendered HTML documents. TextSoap 7.4.3 – Flexible text editing utility. Notability 1.5.2 – Note-taking and annotation made easy.